I like turkey fine. It’s good. I like ham, too. I’m pretty on board with thanksgiving meats. For example, I made you these Thanksgiving Meatballs and it was a real party. 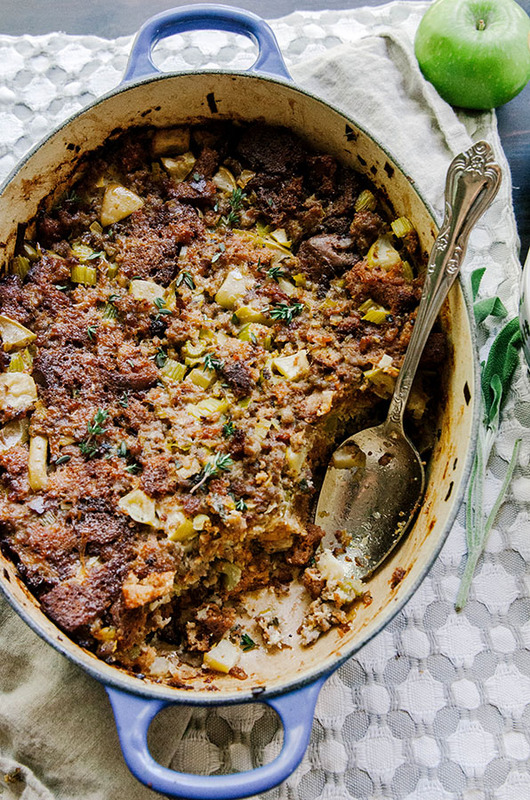 But, if I had to pick the star of the thanksgiving table, I would one hundred percent go with the stuffing. It’s savory, comforting, and the perfect gravy delivery system. Guys, we all need a good gravy delivery system, right? Yes. Until it become socially acceptable to just mainline gravy directly into our veins or play a game of Gravy Pong, stuffing is the answer. I made you the stuffing that my family is absolutely famous for last year. Papa Lou’s Famous Italian Stuffing is the stuff of legends–in fact, until last week it was the only stuffing I had ever attempted to make or recreate. It’s a perfect food. Honestly, in making another kind of stuffing I felt like I was cheating on my dad’s perfect recipe. But, it’s nice to have options, right? Maybe we just don’t tell my dad. He doesn’t have to know. We can keep with stuffing infidelity between me, you, and the rest of the internet. I ended up getting my hands on a bunch of my friend Jennifer’s bread form her grain-free bread business Legit Bread Company…so, like…what was I going to do? 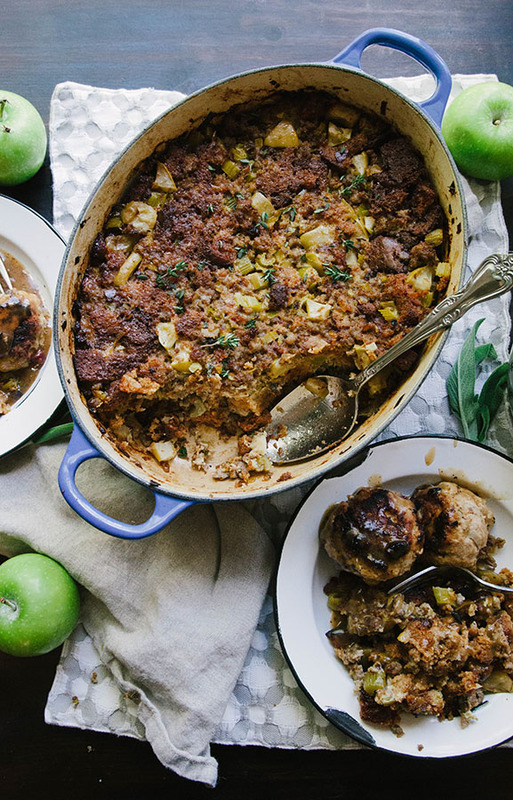 NOT make you a stuffing recipe? Um, no. I am not a monster. I made you stuffing. I put apples in it. There’s a bunch of herbs and sausage. It’s good, you guys. It’s very good. This bread made making a grain-free stuffing very painless. I highly recommend getting your paws on some. Both the flavor and consistency worked out great for this recipe. The bread has a honey wheat sort of taste, which married so beautifully with the apples and the sage! Not to toot my own horn, but I made stuffing that my father wouldn’t shake a stick at. This is a big deal. Also, we’re still not telling my dad, so we won’t be one hundred percent sure that he would like this or not write me out of his will after finding out how I’ve betrayed the family stuffing recipe by committing the cardinal sin of Thanksgiving food philandering…but, you know…I’m doing my best. We’re all just doing our best. Plus, remember those Thanksgiving Meatballs with Easy Pan Gravy (pictured above)? 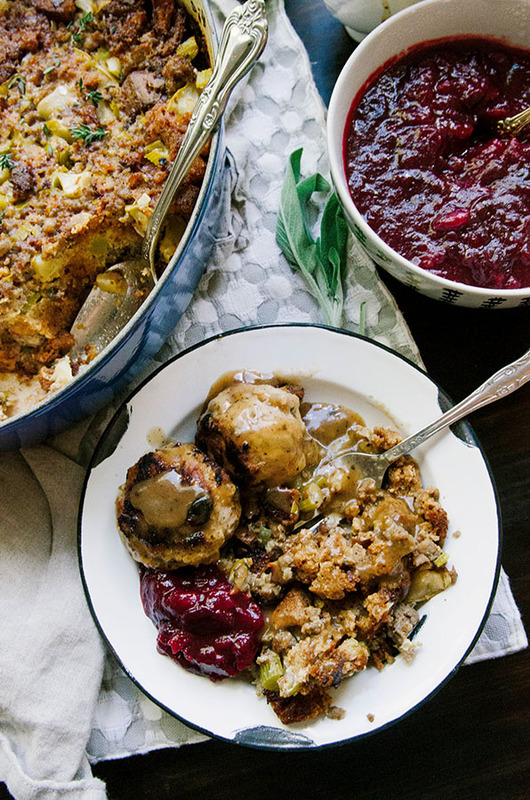 Yeah, well…it’s time to add some stuffing to that plate. Slather it with pan gravy. Like, a lot of gravy. Don’t be shy. It’s Thanksgiving. This is the one holiday where you’re doing it right if you have a lot of gravy on your elastic waist sweat pants come evening. Right? I think so. Thankful for all of you blog reading turkeys today and every single day. Honestly, you’re the best. Thank you for making me feel like it’s cool to come here and blab about Gravy Pong and Stuffing Infidelity. I forking love you. The day before you're planning to make your stuffing, cut your loaf of legit bread into cubes and lay it out onto a baking sheet in a single layer. Allow it to sit out for 24 hours in order to become stale. If you need to accelerate this process, you can crisp it up under in an oven by baking the cubes at 375 degrees for 20 minutes, flipping them halfway through. I personally like to use both these methods--letting it stale up, and then crisping it right before use. Set aside your dry bread cubes for later use. Heat up your butter or ghee in a enameled dutch oven over medium heat. Allow the butter to completely melt and cover the bottom of the pot. Add the leek to the melted butter and saute until the leek has softened. If your sausage is in casings, remove the casings and add the sausage to the pot with the butter and the leeks. Use a spatula or a spoon to cut up the sausage into bite sized pieces. Allow the sausage to cook all the way through, until there are no pink pieces left. 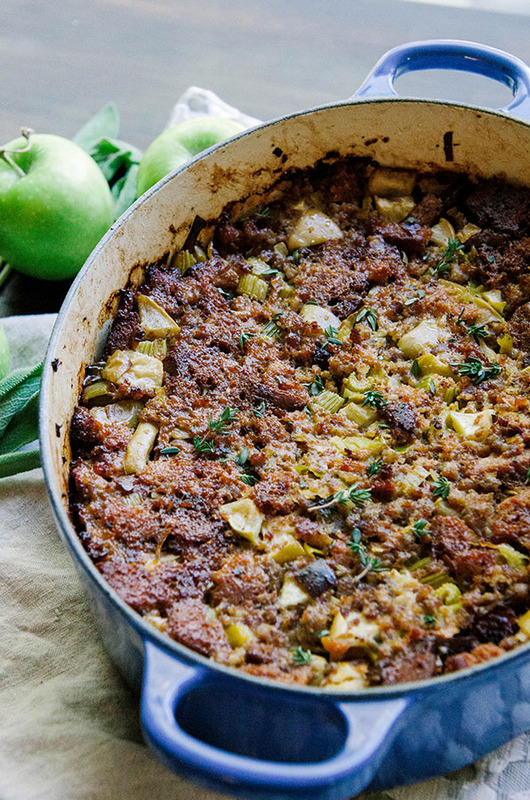 Once your sausage is cooked, add the apples, celery, sage and thyme. Stir and allow the apples and celery to cook down in the butter and sausage fat. The apples should soften slightly within five minutes or so. Once your apples and celery have cooked down a bit, it's time to add the stale legit bread cubes. Add half of them into the pot and stir. Add in the turkey stock at this point, and the rest of the bread cubes. The bread will begin to break down and incorporate itself into the other mixture. It's okay if the cubes don't stay perfectly intact. You want them to break down a bit and mix into the other ingredients. At this point, taste the mixture and adjust seasoning if necessary. Add in salt to your liking. Remove the stuffing from the heat. Beat two eggs very well. Pour the beaten eggs into the stuffing mixture and stir together. This is going to help bind your stuffing. Using the back of a cooking spoon, flatten out the top of your stuffing. Put a lid on the top and bake it for 20 minutes in the oven. After 20 minutes, remove the lid and bake it for an additional twenty minutes, or until the top is crispy.